Ciovo is a true gem of the Dalmatian tourism, a lovely island hidden in the Kastela Bay and situated right in front of the ancient city of Trogir. A drawbridge connects it to the mainland; a few steps across and you will find yourself at the center of the old town in Trogir. With its typically Mediterranean settlements, a variety of natural beaches, beautiful weather, clear blue sea and a diverse tourist offer; Ciovo is an ideal destination if you prefer a more intimate surrounding and wish to enjoy the peaceful vacation. Ciovo ensures that ideal combination of sweet isolation and proximity to urban zones, with Trogir and Split being just a short walk or a car ride away. The island of Ciovo is consisted of six bigger settlements, every one of them representing a small oasis among the rich woods of the Mediterranean pines covering the area. Regardless of which one of these places you chose as your final destination, you will find the equal amounts of beautiful scenery, rich heritage and friendly attitude in every one of them. 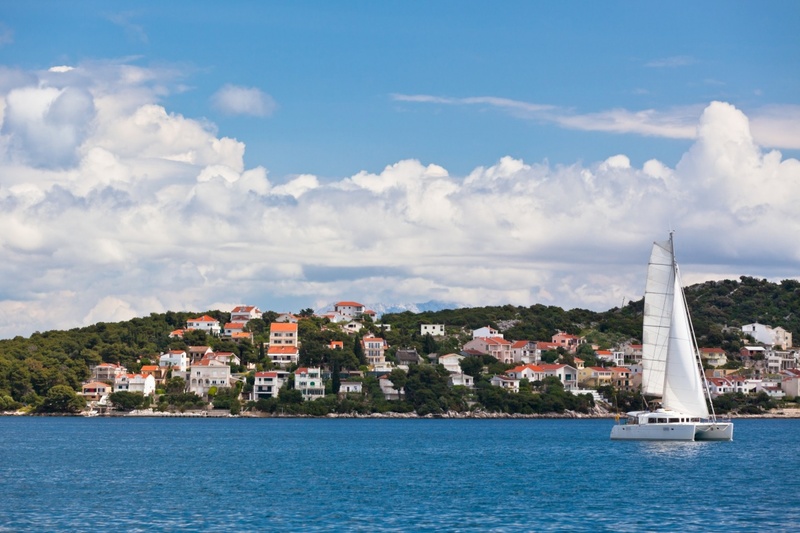 Okrug Gornji and Okrug Donji are twin settlements and perhaps the most popular tourist resort of the island. They offer the majority of accommodations, restaurants and beaches. Arbanija offers a more peaceful surrounding, famous for its beautiful beaches and hidden coves. Slatine settlement is connected with Split through regular boat lines, as it is closest to the big city. Apart from the possibility to arrive by boat, you can reach Ciovo by bus or by car. Once you reach Split, it is easy to hop on one of the city buses regularly driving to and from Trogir or Ciovo. And if you came with your own car, then Ciovo is even easier to reach. There is a wide range of accommodation possibilities to choose from. Although Ciovo doesn't have its own hotel facilities, there are numerous private apartments, houses and rooms to rent depending on your wishes and preferences. The majority of accommodations are very reasonable priced and in close proximity to the seashore. Ciovo residents are proud of its beautiful and diverse beaches. From crowded, pebbly shores to hidden and romantic rocky coves, there truly is a choice for everyone. Whatever bathing destination you choose, the richness of the local vegetation will protect you from the summer swelter and the crystal clear blue sea will provide just the right amount of refreshment under the hot Dalmatian sun. Almost every bigger beach offers a variety of additional activities and sports; from diving and fishing to paragliding and jet skiing. If you happen to get tired of the beach, feel free to explore the rich cultural heritage of the island and the nearby Trogir. Ciovo has been inhabited since the prehistoric times, but most of the preserved monuments are from the late medieval and renaissance period. During your evening walks, you can admire several lovely and well preserved churches scattered across the island’s settlements. Make sure you don’t forget to taste the wonders of the local cuisine during your stay at Ciovo. Several restaurants and taverns are offering typical Dalmatian dishes accompanied by the quality wines from the local vineyards. Freshly caught and simply prepared fish and seafood specialties, enriched with the aromas of the Mediterranean herbs and the unique taste of the olive oil will gently waken all of your senses. Find information about selected Hotels, apartments and rooms in Ciovo to choose the perfect place for your accommodation.